LAHORE: An undeclared gag on media is in place in Pakistan as journalists are prone to employ self-censorship while reporting on sensitive subjects. The views were expressed by Steven Butler, Asian Program Coordinator of Committee to Protect Journalists, Ahmed Rashid, Member Board of Directors CPJ, and Mustafa Hameed, Producer at CPJ, at a “Meet the Press” here at the Lahore Press Club on Tuesday. 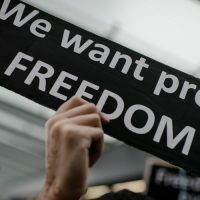 “There are still many no-go areas for the journalists where they cannot write or speak with freedom. They are so regular to self-censorship that now they don’t even name the named. The state of Pakistan has to understand the importance of freedom of the press,” Steven Butler added. Many journalists explained about the problems while reporting on certain institutions and areas. They expressed their concerns over their limitations to report on certain subjects in FATA, Balochistan and other restricted areas. Journalists face trouble in asking questions to the authorities and are bound to write in a way that pleases them. They requested the delegation to make some more efforts to help them in reporting properly and do justice to their profession.